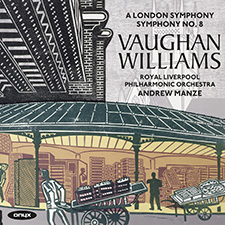 Andrew Manze’s interpretations of Vaughan Williams’ Symphonies have met with acclaim from audiences and critics alike. This first CD in a complete symphony cycle with the Royal Liverpool Philharmonic Orchestra contains ‘A London Symphony’ and the kaleidoscopically brilliant 8th. Inspired to write a purely orchestral symphony by his composer friend George Butterworth in 1912, the composer suggested it was ‘a symphony by a Londoner’. The 8th Symphony, scored for ‘all the ’phones and ’spiels known to the composer’, is a highly inventive work from the end of his life of which he said the opening movement was ‘seven variations in search of a theme’.